Contrary to traditional differential pressure leak testers which require complicated calculations to find out the leak rate. TLT-3600 flow type air leak tester can display it directly & no more complicated calculations are needed. Mass-flow method is employed on the sensor. 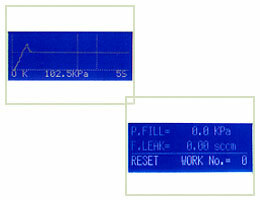 Air Pressure charge condition is displayed in "Graph" as picture shown beside by the parameters. Work number management is possible. Work condition is changed automatically by exterior switching function. Unbelievable price on Air Leak Tester TLT-3600 in Seremban (Malaysia) company Bestever Enterprise.